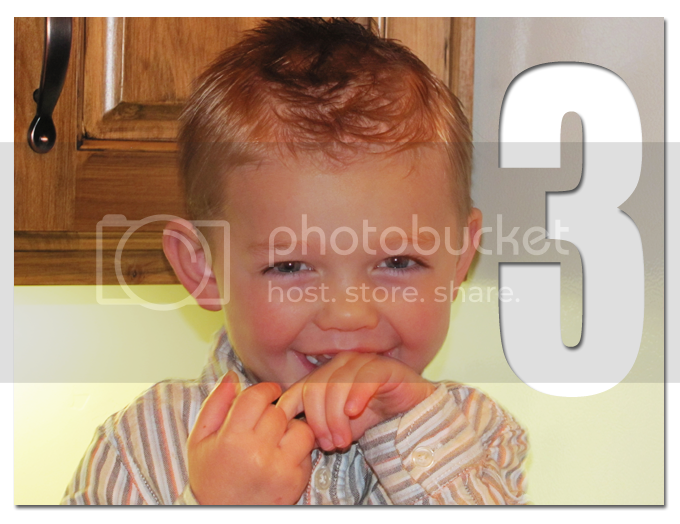 Our Little Family: LoOk Who's ThReE!!! Three years ago today, an amazing 23-year-old girl blessed Mike and I with the opportunity to be parents to the cutie pictured above. We can't celebrate Bryson's birthday without thinking of and thanking her. Her choice changed our lives forever! We love you so much Kimbralee! 7:30 am - Woke up to mommy singing happy birthday to him which planted a great big birthday smile on his face. He was so excited about his big day. 8:00 am - Ate a birthday breakfast and sang happy birthday to himself. 8:30 am - Opened one birthday present (he had to save the rest for when daddy got home). He got a little water gun that he picked out yesterday. 9:00 am - Helped mommy clean his room to make room for all of his new birthday toys. 9:30 am - Got a birthday call from Nonni. He told her about his new gun. 10:00 am - Had a sword fight with mommy. He was the bad guy, mommy was the good guy. 11:00 am - Went to Chuck-E-Cheese for a birthday lunch and to play. He won 14 tickets and traded them in for a teeny-tiny plastic lobster which he lost two minutes later. 12:30 pm - Ate birthday ice cream with mommy. 1:00 pm - Had a long birthday nap. 5:00 pm - Got a happy birthday video message from Mommy Kim!!! He couldn't stop smiling. 5:30 pm - Got a birthday call from Granny Goose. 6:00 pm - Ate a birthday dinner. Chicken enchilada's, rice and veggies. 7:00 pm - Daddy got home and gave him a big birthday hug and kiss. 7:30 pm - Rachel, Brock, Granny Goose and Grandpa Hink all stopped by to watch him open presents. 8:00 pm - Played with all of his new presents. 8:30 pm - Bathed with some of his new presents. 8:45 pm - Went to bed with his new presents. We're having his official birthday party on Saturday, so stay tuned for that!